It's been the central question since Jack Kirby's cover to The Incredible Hulk (vol. 1) #1 back in May of 1962. It's also the title of the very first issue of Al Ewing & Joe Bennett's masterful revival in 2018's The Immortal Hulk. Of course, the full version of the question bears mentioning: "Is He Man Or Monster Or Is He Both?" Over the last year, we've seen a lot of intriguing details in the new series. This Hulk appeared at first to be unlike other incarnations we'd seen before. He was prone to vengeance against those who wronged the helpless, such as when he decimated a biker gang to get to the young man who'd killed a 12-year-old girl (and Banner himself) at a gas station convenience store earlier the same day. Furthermore, like the original, grey-skinned Hulk, he only appeared at night, but this time only after Banner himself died. It didn't stop there. This vengeful, judgmental monster found he kind of liked the moniker of "Devil Hulk" while in battle with the Avengers. The name recalled a seldom-seen version of the Hulk who was never seen outside the recesses of Banner's mind (in Paul Jenkins' underappreciated run). This Hulk also had the uncanny ability to remain alive and even control the parts of his body even after being disassembled into several glass jars. Although the Hulk had previously demonstrated fast healing bordering on total invulnerability, doing what Humpty Dumpty couldn't do puts him in a different and highly unusual league. But most importantly, Ewing's Immortal Hulk has introduced the extradimensional "green door," a gateway to the lowest of hells ruled by a Cthulhuesque being called the One Below All. (The name inspired by its direct opposite, the One Above All, from Ewing's New Ultimates series of recent vintage.) Unable to gain entry to our world alone, it instead wears the souls of the dead like clothes. In its first direct strike against the Hulk, it used the soul of Banner's abusive father, Brian. "Brian" in turn possessed Walter Langkowski, Banner's college roommate who exposed himself to gamma rays and became the superhero known as Sasquatch. The Hulk's newfound ability to absorb gamma radiation worked to his disadvantage during the battle with Sasquatch. Because the One Below All uses gamma as a medium, draining the energy from Langkowski's body allowed the creature, still wearing Brian's soul, to possess the Hulk. The creature persuaded him to return to Los Diablos Missile Base, where the fateful gamma bomb had originally detonated. There the Hulk fought "Crusher" Creel, a.k.a. the Absorbing Man, who absorbed the gamma energy from his body--and with it, the One Below All, who appeared very differently to Creel. And when Creel stumbled into the spot where the detonation occurred, the world turned upside down. He and those around him were transported into the hellish domain the One called home. In this Hell Below Others, the various parties near the event are divided into teams of two, with the Hulk alongside Jackie McGee, the reporter tracking him since issue #1, while Creel is teamed with Eugene Judd, friend to Langkowski, better known as Puck. So far, Langkowski and Carl Burbank, an assassin better known as Bushwacker, are unaccounted for in the "Hulk in Hell" story. However, most remarkably, Bruce Banner appears separated from the Hulk, bathed in green light upon a high cliff, while his father Brian stands and explains the story of the One Below All. In addition, Ewing narrates a comparative religions study. He burrows into Kabbalist Jewish lore, evoking the unity and duality of God. In fact, the story in issue #10 is titled "Thaumiel," which are the twins of God. In #11 he defines Thaumiel further, explaining that its ruler is Satan, whom, conveniently, Hulk has been compared to since the very first issue of this run. However, I think those looking for a deeper reading of the text are emphasizing the wrong part of the puzzle, and issue #12, titled "All on That Day" (an ode to Nina Simone's "Sinnerman"? ), crystallizes my thinking by keeping the Kabbalist view of Hell but also bringing in the Zurvanite Zoroastrian concepts of the god Ahura Mazda and its opposite, Angra Mainyu, as twin brothers. In a book where the focus is the dysfunctional relationship between father and son, it's hard not to see a panel such as the above as related to the characters' past. But then, why are there two cribs in the picture in question? 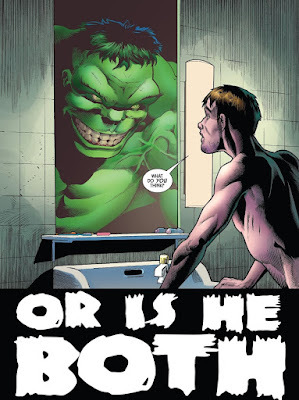 Through McGee, Ewing seems to be metacritiquing the historical interpretation of the Hulk that's existed since Peter David's revolutionary Incredible Hulk #377, where the two Hulks (to that point) were explained as multiple personalities of Bruce Banner given form by the G-bomb. And the extant personality seems to disagree with that interpretation. The answer is one I think we've already seen without realizing. It's staring us in the face since the very end of issue #11, in the climactic moment where we see Brian talking to the suspended body of his son in the green light. If you think of Hell in the strictest interpretation, it's a place where souls go when they die. So, if the Hulk, or Hulks if you prefer, are mere alters of Bruce Banner, why would they be separate in Hell? Unless, of course, Bruce Banner and the Hulk have an altogether different relationship than we've been led to believe all of these years. 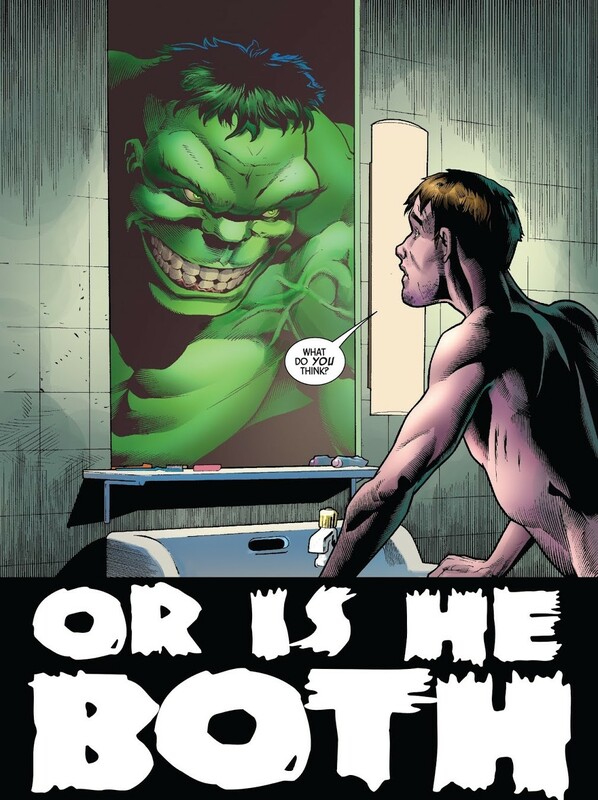 Unless Bruce Banner and the Hulk are brothers, not alters. Remember that twins aren't an aberration in the Hulk mythos. In Peter David's out-of-continuity novel, What Savage Beast, Betty gave birth to twins named Ross and Brett before Ross died and Brett was kidnapped to be raised in a dystopic future by the Hulk's future self, the Maestro. 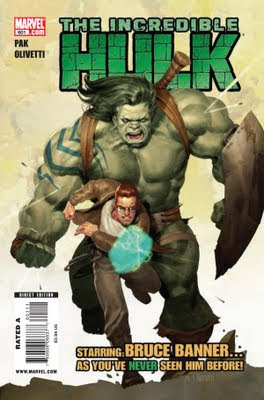 And in-continuity, Greg Pak wrote of Skaar and Hiro-Kala, the Hulk's twin sons by his alien wife Caiera. And twins, as anyone with a passing familiarity with genetics will say, run in families. So why haven't we heard anyone talk about Bruce Banner's brother before now? There are a few possibilities. It could be that another son was expected but that he was stillborn. Or perhaps he fell victim to the vanishing twin syndrome, wherein a twin dies in utero and its tissues are reabsorbed, often by the mother or sometimes by the remaining twin. What if the Hulk were that vanished twin, absorbed back into Bruce, brought to life when the G-bomb struck? It might even go to great lengths to explain how the Hulk possesses such remarkable healing abilities as he's demonstrated in the body-horrific issue #8. If the Hulk is a vanished twin--fetal tissue reabsorbed into his brother--then fetal tissue has unique properties that developed tissue does not. Hence why many scientists have begun experimentation on stem cells in therapies for treating various genetic diseases. I'm spitballing here, but perhaps the Hulk's healing derives from being, in effect, a mass of super stem cells? Put it all together and it sounds like the only remaining questions are just why there's so often a childlike Hulk and a smarter, craftier one. We'll see at least a few of the answers in The Immortal Hulk #13, on sale a week and a half from now. But in the meantime, we've got a lot of speculating to do. If the answers are even close to what I've postulated here, well, we're in for a grand old time as Hulk fans.